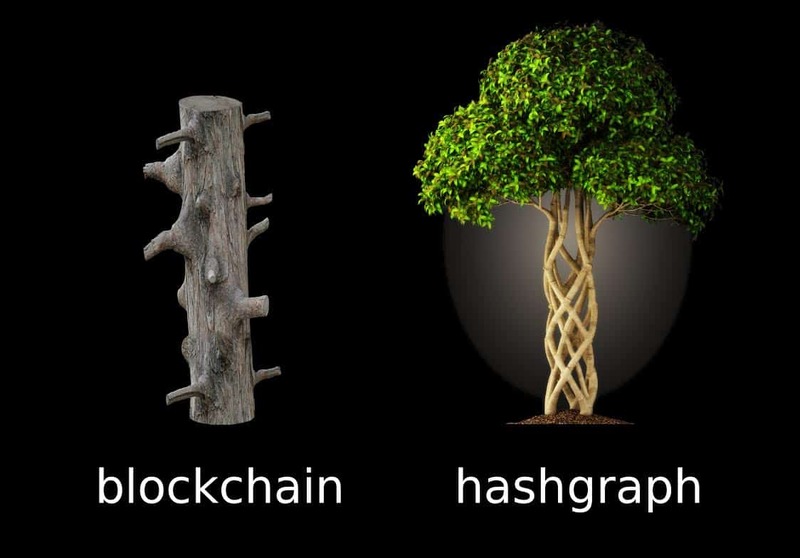 Hashgraph is a data structure and consensus algorithm that is fast, secure, and fair, created by the boffins at Swirlds. Swirlds is a software platform designed to build fully-distributed applications that harness the power of the cloud without servers. They say that users can develop applications with fairness in decision making, speed, trust, and reliability, at a fraction of the cost of traditional server-based platforms. Hashgraph is not a blockchain but a revolutionary algorithm, mathematically proven to be fast & fair, implemented into current software, not a marketing concept that’s not yet available. So, how does Hedera Hashgraph compare to blockchain technology? Let’s find out…. Hashgraph uses two unique techniques (1) Gossip about Gossip and (2) Virtual Voting to achieve fast, secure, and fair consensus. Gossip is a computer science term which can be defined as calling any random node and telling that specific node everything that you know. In distributed ledgers, the “baseline” or minimum bandwidth required is that the transactions go to every node. A gossip protocol can achieve this transfer of information exponentially fast. Gossip about Gossip refers to attaching a small additional amount of information to this Gossip/transaction payload, which are two hashes containing the last two people talked to (hence, gossiping about the information gossiped). Using this information, a Hashgraph can be built and constantly updated as more information is gossiped by each node. Once the Hashgraph is built, it is extremely easy to know what a node would vote, because we know what each node knows, and when they knew it. This can now be used as an input to a voting algorithm and know which transactions have reached consensus quickly. Hashgraph is very fast and has a low consensus latency which enables a new range of use cases and applications. There is no use of miners which is why it can generate 100’s of thousands of transactions per second, rather than blockchain which can process only an estimated 3.3/7 blocks per second. The blockchain is slow by design to allow miners to come to an agreement on which block to put into the network and as a result, it can only process a low amount of transactions per second. Plus the person who wins the transaction can influence the order of transactions making it not fair, unlike Hashgraph. Hashgraph serializes all transactions with cryptographic timestamping, unlike in a blockchain where miners determine the order in which transactions are placed within each block. In certain cases, the transaction order is important, EG. two different people purchasing shares in a stock where the first order to go through will likely get a cheaper price. Hashgraph orders transactions according to the timestamp of when the population of nodes received them — thereby ensuring they are recorded fairly. As it stands Hashgraph has yet to release it’s token metrics or how it intends to use tokens (if at all) on the exchanges. We do know that the Hashgraph network will have a native utility token which will allow people holding the tokens to distributed applications on their platform. The token may also be “staked” and used to run a node (eg, adding CPU to the Hedera public network), thereby providing the network security within the public ledger. They expect the token to act as a unit of value to motivate responsible use and governance of the platform too. For this reason we cannot give a score based on non-existent numbers. Leemon Baird is the Co-Founder/CTO of Swirlds and inventor of Hashgraph. He is clearly a very intelligent man with a fountain of knowledge. He has a PhD in Computer Science from Carnegie Mellon University, he was Director of Security Engineering at Motorola & Professor of Computer Science for the US Air Force Academy. His right hand man is Mance Harmon, the Cofounder and CEO at Swirlds. Mance achienved an MS in Computer Science from the University of Massachusetts Amherst. Previously to Swirlds he was Head of Labs & Architecture at Ping Identity, which is the leader in Identity Defined Security for the borderless enterprise, allowing the right people to access the right things, securely and seamlessly. We also have some very experienced advisors on board, the main one being Slava Rubin who was the co-founder of INDIEGOGO. We also have John Best -CEO, Best Innovation Group, and Co-Founder, CULedger — Dave Asprey Founder of Bulletproof which is an international coffee company. Aaron D. Moore — CTO, Cyber and Intelligence Mission Systems Division. All advisors have achieve a massive amount of success so if they believe in Hashgraph, with their help it should rocket! The team receive a 7/10. Considering Hashgraph have not disclosed their token metrics, they seem to have a huge amount of support from the crypto community. I believe this is a result of people knowing that blockchain technology is lacking in places and people must believe this is the future. They are doing their best to write regular updates on Medium & explaining their technology at crypto events as well as online with video tutorials. All this helps to create buzz and a clear understanding of what they are trying to achieve for the community. Hashgraph receive 8/10. It’s very hard to predict if Hashgraph will be the next blockchain or if it will be successful. It’s struggle will be that it relies on developers to believe in it to create a community of users. Naturally people don’t like change, but i do belive that there are enough positives to convince people to back Hashgraph. I personally believe that it’s a unique solution to the limitations that we currently have with blockchain which will encourage users to gravitate towards them. I will definitely be keeping an eye out on Hashgraph’s updates over the coming weeks and months as i believe this could revolutionise the crypto world as we know it.